My dad isn’t a sailor. His interest, when I was growing up, was fishing. We fished every way imaginable. We’d wade into Cedar Creek in search of a hole hiding smallmouth. We’d slide a canoe into Mauthe Lake and drop worms for bluegill. We’d pack the ’74 Dodge Dart, drive north to rent a cottage and an Alumacraft to jig Walleye and hunt the big Muskie on the mighty Flambeau. And we would walk out to the lighthouse at the end of a long rocky break-wall to net smelt or cast for steelhead, depending on the season. When you stand in the shadow of the Port Washington lighthouse (a few blocks from Sailing Magazine’s world headquarters), you are a front row spectator as sailors make way for open water. Dad thought they were nuts. It seemed right, and kinda’ scary to me. 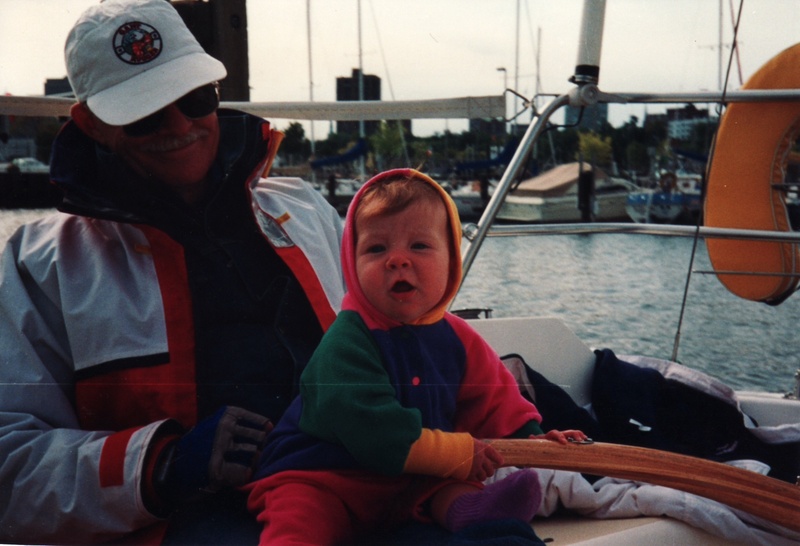 So my first sailing experience wasn’t with my dad, it was at a summer camp. Minikani, on tiny Lake Amy Belle, is a general purpose camp, where kids can shoot a .22 rifle, dig for mud-puppies, or get a taste of sailing. You had to pass your swim test before you could sign up, because the fleet was moored and the kids and counselors swam to the boats. They had Penguins, an X-boat, and a couple of ‘50s era wooden C-scows that seeped and had to be bailed and floated each class. 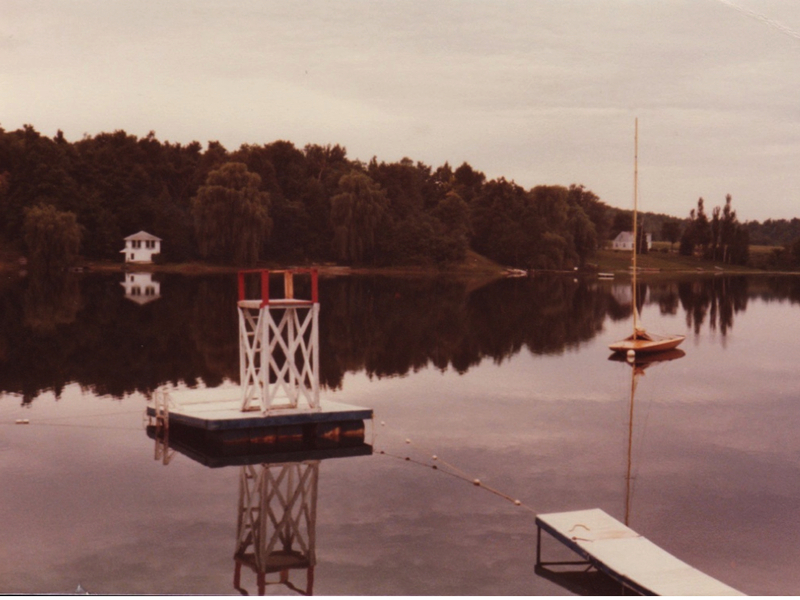 I recall a breezy summer day, crammed in the cockpit with seven other dripping kids, nervously watching the camp counselor raise a monstrous noisy mainsail and the boom bouncing and swinging near our heads. Then he lined us up on the starboard side, let go of the pennant and we blasted off towards the opposite shore. It felt like a rocket ship, powerful and exciting, and it lasted all of twelve seconds. Amy Belle is at most a quarter mile wide, and our planing scow ran out of room fast. So the counselor drove the bow down and held the mainsheet tight to send us into a deliberate capsize. After counting bobbing kids, he called us all to swim to the bow and asked for help pushing it around so that it faced the home shore. The biggest kids climbed onto the leeboard and we righted her. We shoveled most of the water out of the cockpit with our hands and feet, and the bailers had just enough time to empty the rest of it on the next blast reach across the pond. All class we sailed back and forth; capsizing, swimming, hauling, pushing, righting, bailing and then sailing again. In two hours we might have sailed for four minutes, at most. There simply isn’t room in a 20-foot sailboat for eight people to go from one side to the other. The counselor had landed on the only way to make sailing happen for us. So for at least a few months of my childhood, I assumed all tacking involved swimming. This too, seemed right, and not scary. After all, I had passed my swim test. As a young adult with a taste of legitimate tacking, while racing Solings and other small boats, I sent a letter to Bill Schanen, the publisher of Sailing Magazine, offering my services as crew on his gleaming new sailboat Mainstreet. On a cold, breezy spring day, I nervously tailed the halyard while a monstrous noisy mainsail rose above us and the boom bounced and shook above our heads. Bill asked for port-side weight and drove down, and the boat came to life. We had set sail in the lee of the break-wall since a two-day nor’easter had built big waves outside, and then we charged through the shadow of the Port Washington lighthouse where dad and I had fished many times when I was a kid. Honestly, this didn’t seem right. Wasn’t it going to be dangerous? What about gales? Shouldn’t I be fishing? In the decades since, I’ve filled nearly all my summer free time with sailing with my kids, but only fished a handful of times. We’ve even introduced sailing to my dad. He now sometimes joins his grandkids on Lake Michigan. I think we’ve proven to him that not all sailors are idiots. My basic observation is that when parents and kids spend time together outside, then the next generation might do something similar. It’s a virtuous open loop, and if we’re lucky to find ourselves in it, it makes for great living. I’m excited to be writing a column for Sailing Magazine (the first is in the November 2012 issue). I plan not to spend too many words on fishing, or things other than sailing. But it feels right that we’re here again, standing in the shadow of the Port Washington lighthouse. I must say that sailing is a way better compare to fishing but if you are really craving for enjoyment then go for fishing. It is so thrilling! You are currently reading Fishing versus Sailing at Saving Sailing.